Two winning tickets, one in California and one in Atlanta, Ga., have been identified in the Mega Millions lottery jackpot, valued at $636 million. NBC's Gabe Gutierrez reports. A $636 million jackpot — the second-biggest lottery payout in U.S. history — will be split among at least two winners after tickets in California and Georgia matched all six winning Mega Millions numbers Tuesday night, officials said. The California ticket — with winning numbers 8, 14, 17, 20 and 39, with the Mega Ball 7 — was bought at a store called Jenny's Gift Shop in San Jose, state lottery spokesman Alex Traverso said. The shop owner, Thuy Nguyen, was ecstatic to hear a winning ticket was sold at the store. "I feel good!" Nguyen told NBC Bay Area in an interview outside his store late Tuesday. "I don't even know. I cannot sleep tonight!" A lucky someone who shops at "Jennifer's Gift Shop" on Tully Rd. in #SanJose will wake up a millionaire tomorrow. Nguyen, who took ownership of the shop four months ago, said he was contacted by lottery officials to inform him of the winning ticket. The Georgia ticket was purchased at Gateway Newsstand in Atlanta, Georgia Lottery spokeswoman Tandi Reddick told NBC News. Had there been no winners Tuesday, the jackpot would have rolled over, likely approaching or even topping the once-unthinkable $1 billion barrier for Friday's drawing, Mega Millions officials said. There were 259 million possible number combinations that could land a jackpot. Paula Otto, Virginia's lottery director, said that by the drawing at 11 p.m. ET Tuesday, 65 percent to 75 percent of the possible combinations would have been covered. Otto added that $336 million in tickets were sold for Tuesday's drawing. Officials had projected $319 million. 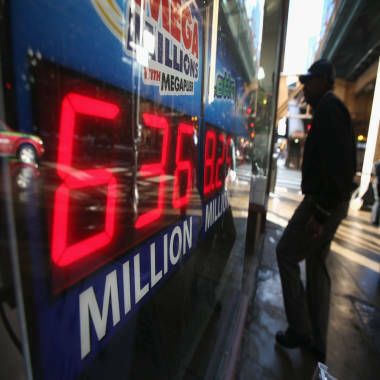 A sign in Chicago on Tuesday advertised the second-largest lottery jackpot in U.S. history: $636 million. The surge of spending pushed the prize closer to the record U.S. jackpot of $656 million, won in March 2012 in a Mega Millions drawing. The $636 million — before taxes — is on the table only if a winner or winners is willing to spread the payments out over 30 years. If it's taken all at once, it's worth "only" $341 million.